For many families it is an annual tradition to add new pieces into their holiday ornaments and décor collection. The ideal holiday souvenir will immediately add joy and festivity to their home, as well as serve as an heirloom to pass on to loved ones in the future. The following is a comprehensive list of the best holiday items to give this season. These are pieces that will be an instant hit and also treasured for many years to come. Golly old Saint Nick is a beloved holiday personality that will bring a smile to the face of people of all ages. 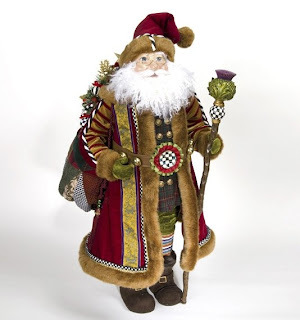 If you are looking for a more timeless feel, select a figure in traditional garb like the MacKenzie Childs White Noel Santa. Another enduring classic is Santa Clause Nutcracker. These beautiful wooden pieces are constructed by artisans in Erzebirge Germany using traditional techniques. ChelseaGiftsOnline is one of only a handful of independent dealers in the US that are authorized to carry the MacKenzie Childs line of home décor. If you prefer a more whimsical rendition of Santa, Patience Brewster and Christopher Radko both offer colorful Santa ornaments that are as fun as they are beautiful. For friends and family who adore our four legged friends, the Patience Brewster Krinkles collection offers a delightful array of nativity figurines, as well as Santa reindeer and a number of fun domestic dog ornaments in most breeds. (Be sure to check out their adorable Terrier!) Patience Brewster’s designs are detailed, colorful, and utterly charming. Whether you choose the amusing Nativity Magi riding their camels and elephants, or the glorious reindeer in their detailed holiday costumes, you are sure to give a gift that will bring joy to any animal lover for many years to come. There are many lovely Hanukkah options this season. If you are looking for a more sophisticated piece, you can never go wrong with Michael Aram. Michael Aram designs are world renown for blending organic aesthetics with classic metal working, resulting in pieces that appear at once both historical and modern. He is best known for his menorah collection, which includes the Pomegranate, Molten, Botanical Leaf and Olive branch menorah collections. If you prefer a more colorful aesthetic, MacKenzie Childs Courtly Check Menorah collection will infuse the room with both joy and light. For children, consider giving a fun dreidle ornament from Christopher Radko. If a friend or loved one has had a recent edition in their family, an ornament is a fabulous way to commemorate the baby’s first holiday season. Choose a piece that honors the baby and speaks to the parent’s décor sensibility. Christopher Radko offers a wide array of glorious children’s themed ornaments including an adorable rubber ducky as well as a number of toy-related ornaments. MacKenzie Childs also features a number of colorful ornaments that would make the perfect commemoration of the baby’s first yuletide. About the Author: Edward Cain is the co-owner of Chelsea at the Grove, a luxury home gifts boutique located in Shrewsbury, New Jersey in the heart of picturesque Monmouth County. Chelsea at the Grove is proud to feature L’objet dinnerware, the highly sought after Ralph Lauren Home collection, as well as the each line of Ricci Flatware.